We are pretty lucky to work with some incredible venues across the beautiful Byron Bay region. It's easy to see why so many couples are opting for Byron Bay weddings, with the lush hinterland, coastal backdrop and ample accommodation making it a popular hot-spot for both local and destination brides. One of our favourite Byron Bay wedding venues? The unique chateau and guest-house at Deux Belettes. 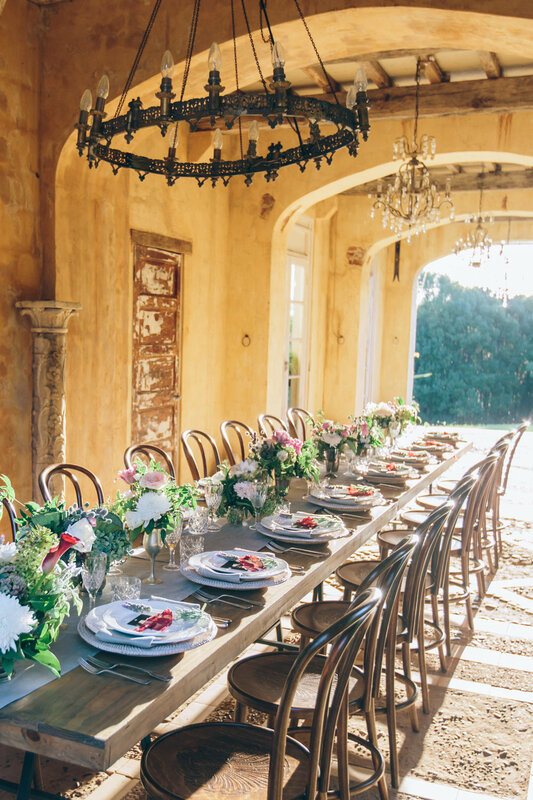 This French-inspired venue is one of the most exclusive properties in the region, only taking a handful of weddings each year. Think cobblestone pathways, manicured gardens and moss covered archways... the entire estate looks like something out of a fairytale, with an atmosphere to match. From traditional sit-down receptions and marquee weddings to elegant cocktail parties, it's safe to say this beautiful venue is best suited for the sophisticated Byron bride. Luckily, we have had the opportunity to help create many gorgeous weddings over the years in this picturesque space. We spoke to venue manager Sharon and stylist + planner Hayley from The Wedding Series to get some insight behind the venue inspiration and their memorable moments - and we definitely received some colourful stories in return! Read on for more stunning imagery and some wise words from the Deux Belettes team! What was the inspiration behind the design of Deux Belettes? Deux Belettes was inspired by a love affair in and with France. After restoring a medieval ruin there with friends, being unable to obtain residency and spending summers on the Cot’ D’ Azur over a 36 year period - Deux Belettes was constructud with booty bought back from France to authenticate the design, and having access to old bridge beams discarded on roadsides after floods in the Northern Rivers. What sets your venue apart from others? Pushing the boundaries of design so no two weddings look alike. Accepting only the best products and suppliers. Exclusive (expensive – yes) holding only a few extraordinary weddings a year. Deux Belettes is one of only a handful council approved wedding venues in the Ballina Byron Bay Hinterland. What has been your most memorable moment so far from a Deux Belettes wedding? Watching in amazement as a bride and groom plunge fully clothed into a freezing pool to cement their love at midnight after the celebrations. Dying of laughter as six private school Englishmen were chased naked around the paddocks by a threatened rooster after they tried to capture our black hens. Taking French authenticity to the next level with our wedding planner being invited by wedding guests in the middle of busy celebrations to a ménage à trois (she declined – we think). Be aware, talk to everyone and trust your own instincts! So if you're still on the hunt for the perfect Byron Bay wedding venue - add this one to your must-see list! Huge thanks to the Deux Belettes team for their insight and input. Need help decking out your Byron Bay wedding with furniture and decor? Contact our friendly team for a copy of our Look Book to get the inspiration flowing!